How Can I Pass My Farm on to Heirs? Whether inherited from your relatives or acquired during your lifetime, several factors may influence your decision regarding the method you choose to convey a family farm to your heirs. Future tax consequences may arise based on the profitability or value of your farming business, as well as the difference between the value of the land when you purchased it and the value when your heirs acquire the property. You may desire to discuss estate tax consequences or the impact of capital gains taxes with your accountant prior to determining which method to choose. One of your children may show an interest in continuing the business, working side by side with you in the day-to-day farm operations, whereas another may not. Preparing a last will and testament allows you the freedom to determine which of your heirs gets what property, or even who may receive a larger percentage interest in the property. Keep in mind if you own several tracts of land and leave each to a different heir, you should include legal land descriptions, which are generally in your deed, so that there is no confusion as to which property is being devised or inherited by each heir. Of course, based on state law and/or the terms of your will, the estate executor must pay legitimate estate creditors first, or estate debts could become a claim or lien against the property. A corporation, partnership or limited liability company made up of yourself and other family members, who own shares or interests in the company, can also own a family farm. Over the course of time, you may choose to gift or transfer your shares to your heirs to continue operation of the business. If you were to die while owning shares or interests, your heirs might inherit them according to the terms of your will. If you do not specify how you wish to transfer your shares in your will, the terms of the corporate bylaws or of a limited liability company’s operating agreement could determine the actual distribution of your interests. You can also establish a family trust prior to your death, or a testamentary trust under your will, for your assets. There are various types of trusts; however, generally, a written trust agreement, whether set out in your will or created during your lifetime, establishes how property passes, under what conditions the trust terminates and names a trustee to manage the trust. If you form a trust for your farm during your lifetime, make sure the deed of the farm names the trustee as holding the property for the benefit of the trust. For example, the deed should read, Joe Jones, trustee for Jim and Bob Farm Trust. Federal law generally specifies an amount, in cash or other assets, which an individual may gift away per year per person without being subject to gift tax. If you choose this method to transfer the farm to your heirs, it could take some time, depending on the number of heirs and the value of your farm. Over the course of a few years, however, it may be possible to gift or deed away specified percentage interests to each heir annually so that they all eventually own the entire farm without you having to pay gift tax. Although estate planning is often considered complicated, some people simply do nothing to transfer property to heirs. A state's laws of intestate succession determine how property passes when someone dies without a will. Surviving spouses and children are primary takers of property upon death; however, laws may vary greatly from state to state as to how much your spouse gets and how much is shared with surviving children. If you don't make a will, you should review your state's laws if you are concerned who will inherit your farm. 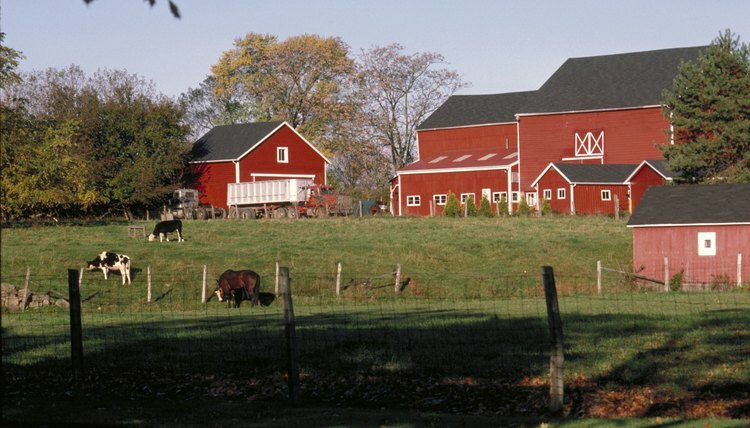 Ohio State University Extension: What Should I Do With the Farm? A sole proprietorship is a business with one owner-employee who holds assets and is directly responsible for all business obligations. He also has sole control over the business. The phrase “passed on” suggests that the owner is transferring his business to another. How you transfer a sole proprietorship will depend on your personal preferences and tax concerns. You can transform the business into another type of organization, transfer the business through your will or assign the business assets to a trust. Does a Wife Inherit the Land of a Deceased Husband? In a marriage, assets of a husband and wife may be jointly owned such that each considers the marital possessions his or her own. Alternatively, the husband may have chosen to maintain separate property, owning land or other assets in only his name. Estate planning, lack of estate planning or even state law may determine the disposition of a husband’s ownership interest and the interest a wife will acquire after his death. Frequently, an estate or inheritance involves multiple heirs. If a last will and testament exists, even it may not define specific property by individual share. A personal representative, or the person appointed by the court to manage an estate, may deed property to multiple heirs as defined in a will or by Ohio state law. Alternatively, a property owner may deed property prior to his death to multiple individuals in an attempt to bypass probate. Whether deeded before or after death, Ohio law determines how title is held by multiple parties, either by language in a deed or by statute.